I have written about this beetle before (1), but it is so beautiful I thought that it would be worth posting a few more photographs which I took this summer. It is a large (about an inch in old money) dor beetle, found in north-west regions of the Iberian Peninsula. It is relatively common on the heather-clad hills of Galicia in the summer, and on warm days these shiny green beetles can be seen flying through the pine forests like little helicopters. 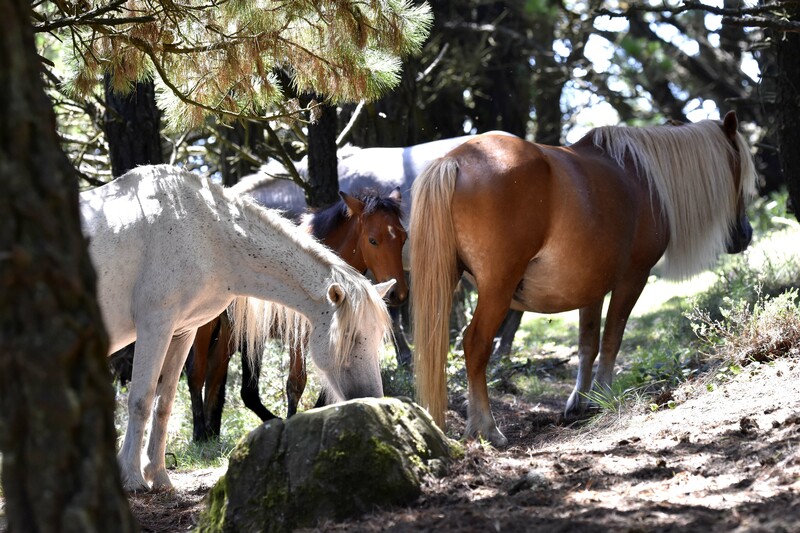 They search out horse droppings; Galician ponies are common on the hills. There are a number (at least 4) subspecies of Trypocopris pyrenaeus, which are present in Andorra, British Islands, Bulgaria, France, Italy, Luxembourg and Spain (3). A shiny, black variety of this species, called the Heath dumble dor beetle, Trypocopris pyrenaeus (Charpentier, 1825), occurs in UK in places like the New Forest. It is rare but not threatened. 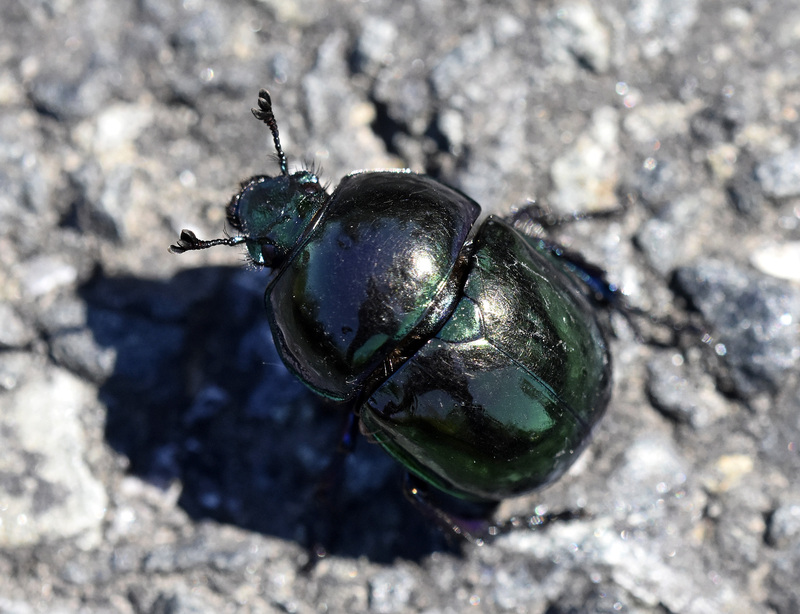 There are two forms of this beetle, a shiny one and a dull one (above). I am wondering whether these are the two sexes. 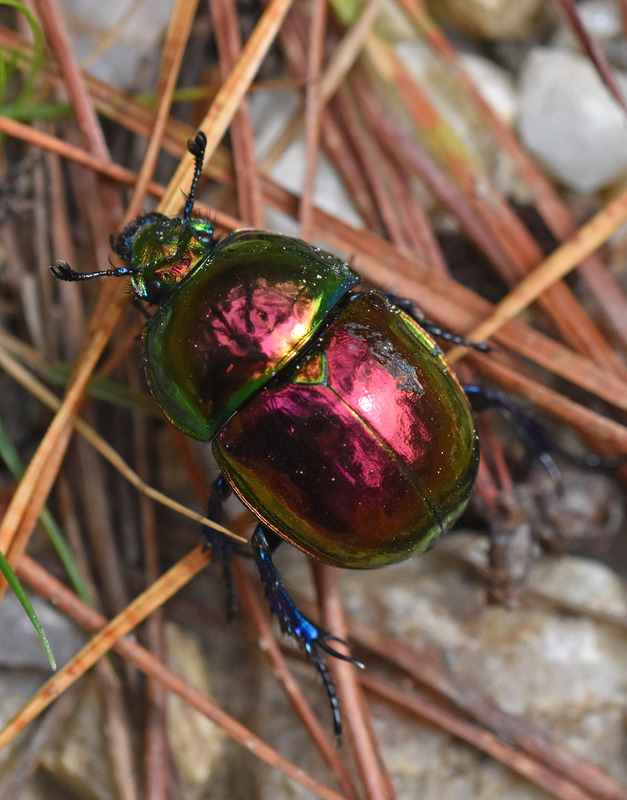 Structural colours like the shiny iridescence on these beetles is sometimes used as an ‘honest signal’ of fitness and might be used by the females to select males with which to mate with. The UV iridescence produced by male wings of butterflies such blue Morphos, is an example of a secondary sexual character which females evaluate when choosing males with which to mate with. These ‘structural colour badges’ are thought to be honest signals, or reliable information if you will, of the phenotypic condition of the males. Could these beetles be using the same system? 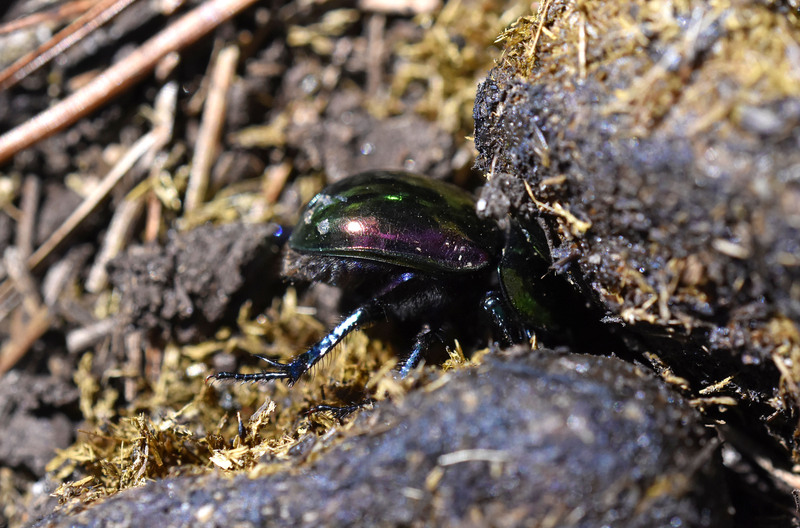 There are other species of dung beetle where the females use the shiny iridescence of males to make their choice of mates. (4). Scope for a research study perhaps? The beetles are relatively abundant in the summer and it would make a great project for a PhD student. And just because they are beautiful, here is a photograph of the dung providers! 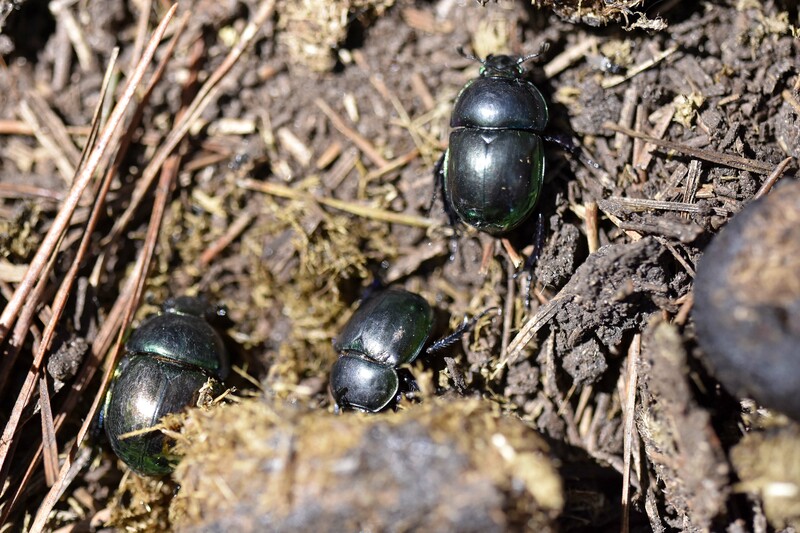 Galician ponies producing dung for beetles! Vulinec, K. (1997). 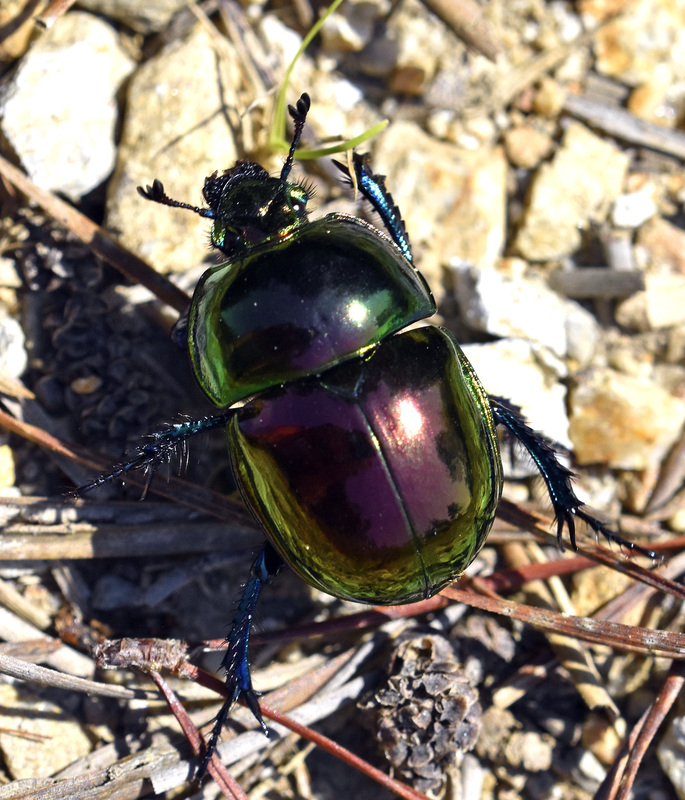 Iridescent dung beetles: a different angle. Florida entomologist, 132-141. Next Next post: A huge bumblebee from Spain: Bombus magnus?